From top to bottom this is a great collection of films. There is not a bad one among them and this is an absolute must see. This is one of the best collections I've seen at any DOC NYC. PINK BOY- Portrait of a young boy who likes to wear dresses. A moving little film about kid who just want to be himself. ROTHMAN- One of the great shorts at this years DOC NYC. A portrait of defense attorney Frank Rothman, who's father was a small time gangster. This is a great portrait of a great character. Its also a great portrait of what its like to be a defense attorney. A must see. REINVENTION OF NORMAL- A wonderful look at Dominic Wilcox, an artist / inventor / designer who looks at the world in a different ways and invents things that are truly unique and a new way of looking at things. It will make you smile from ear to ear. 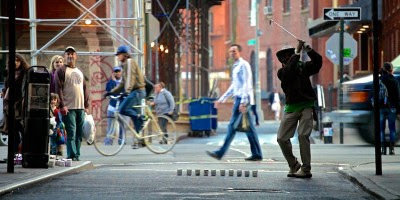 TIGERHOOD- portrait of Patrick a man who plays urban golf in New York City with milk cartons. This is an absolute joy and a wonderful portrait of New York insanity (in a good way). I love it. One of the best. DUNK TANK CLOWNS- Excellent portrait of the carnival clowns and carnival life. Its a glorious look at a part of Americana that most people have never considered. Another must see film. A review for longer review of HEAVY FOG TONIGHT which was reviewed after this collection can be found here. This collection plays Monday November 16th. For tickets and more information go here.